"Bio-readings are...strange. I mean...off the charts strange. Never seen fluctuations like this." If and when we do encounter intelligent life somewhere in the stars, here's hoping that the life forms are friendly and wish us no harm. There's a good chance we may encounter some aliens who are hostile and if that's the case, we'll need a lot of things to go our way. Sending out spaceships that disappear during expeditions isn't really something that goes our way. 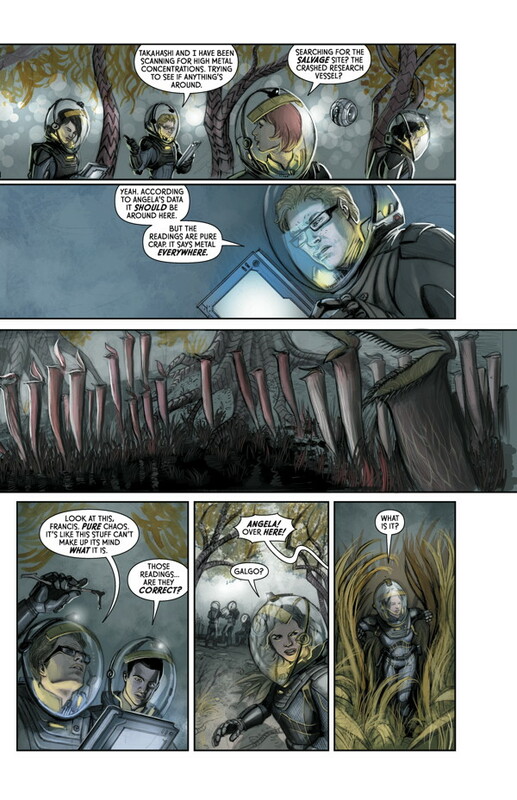 Still, humanity pursues such causes and in Prometheus: Fire and Stone #1 from Dark Horse, things don't go our way. The issue is written by Paul Tobin, illustrated by Juan Ferreyra and lettered by Nate Piekos of Blambot!. When the Prometheus never returned from her fateful journey to LV-223, the questions surrounding the origins of man went unanswered. Now a new team of explorers seeks to uncover the dark mystery that holds not only the fate of the original mission, but possibly their own damnation. Traveling aboard the Greyon and Helios, the crews arrive with the intent of salvaging the wreckage for a tidy profit. Filmmaker Clara is documenting the quest, introducing Captain Angela Foster, astrobiologist Francis Lane and android Elden. What the crew finds on the moon is nothing at all what they were expecting. Prometheus the film felt a little disconnected from the Alien franchise in some ways. There were a lot of obvious connections between the two, but something about it felt a little distant and Prometheus: Fire and Stone #1 feels the same way. Tobin's work on the book feels a little safe, in that it presents the characters in a way that doesn't really lave much room for confusion as to who they are. Framing most of the issue as a documentary somewhat justifies the rather rigid dialogue, even if it comes across as holding the readers' hands at points. 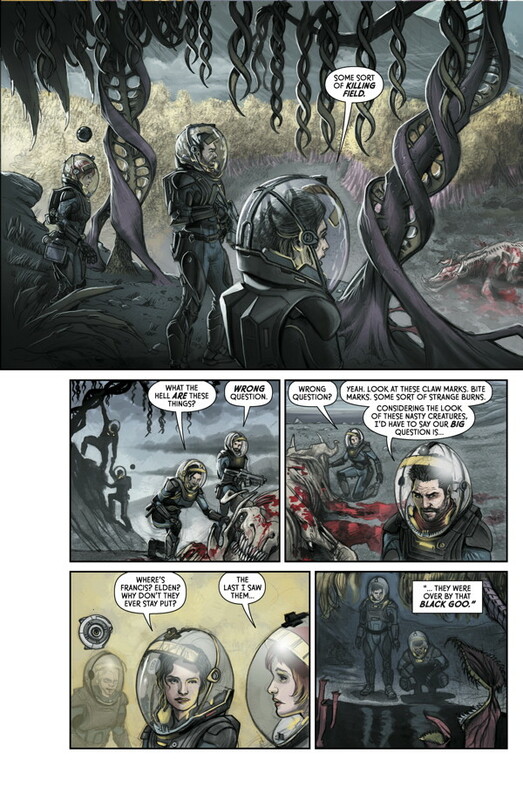 The ending definitely starts picking up the pace and gives readers a glimpse of what they expect from a comic in the Alien universe. Alien has always focused on terror and Ferreyra does a great job presenting the characters in various states of emotion. His characters feel fairly photorealistic, cutting against the backdrops and standing out. The panel layouts feel very organized and fit with the narrative of a planned operation with a focused target in mind. The illustrations of the landscape of LV-223 are very well rendered, giving way to ferocious wildlife who make the book feel sufficiently interstellar. Ferreya illustrates the book with a very elegant look that really does the Alien universe justice and respect. 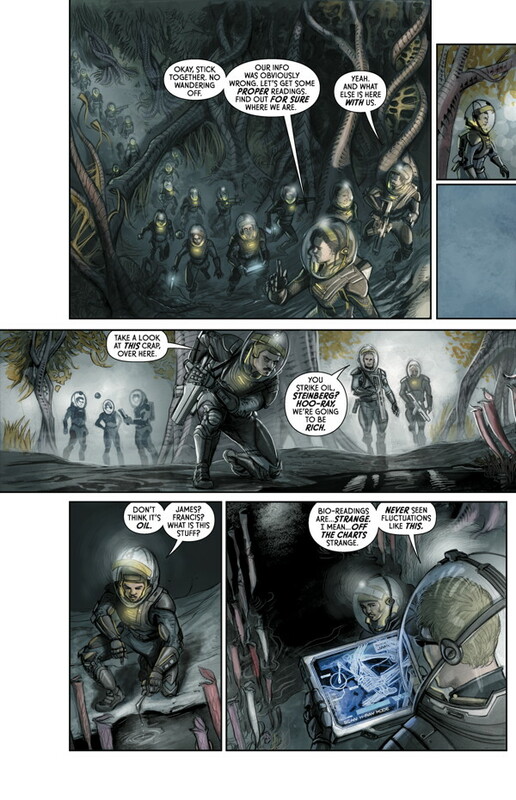 If you're reading Prometheus: Fire and Stone #1, then chances are you're a fan of the Alien franchise. In that regard, the book definitely lives in that universe, even if it feels a little distant from a lot of the other properties and action. Tobin's dialogue is a little force-fed, not really affording the reader much room for interpretation of the events as they unfold. Ferreyra's art is elegant and beautiful, offering a detailed look at a potentially fearful setting for the characters. 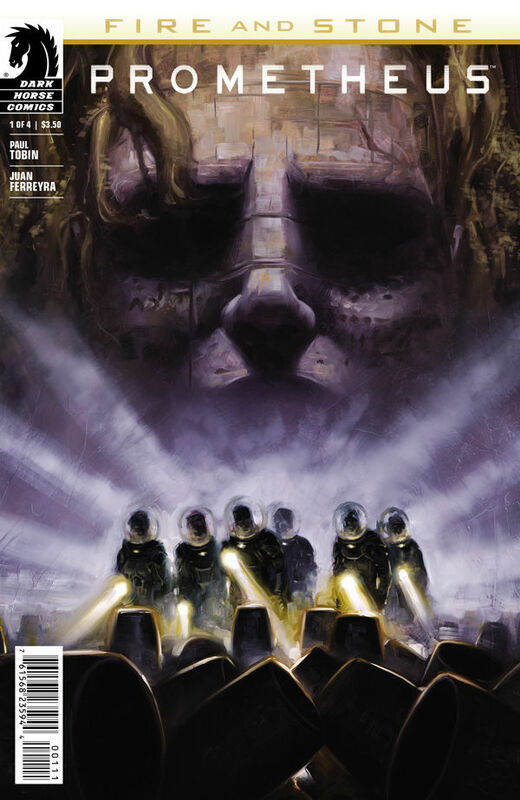 Prometheus: Fire and Stone #1 moves along pretty slowly for most of the issue, while the ending offers up a scene that gets the fireworks lit and prepared for more action. 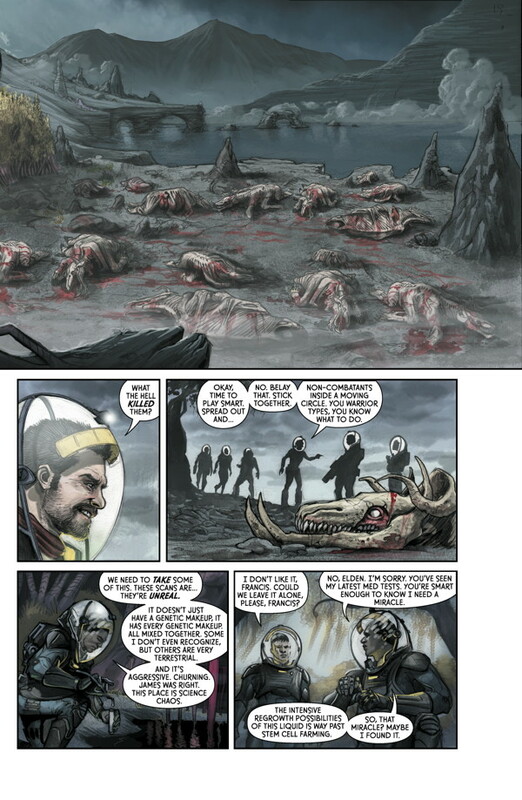 Prometheus: Fire and Stone #1 is in stores September 9 with interiors below.